Description The Kamigamo Shrine is the oldest Shinto shrine in the former Japanese capital of Kyoto. It is dedicated to the deity Kamo-wake-ikazuchi, who appeared miraculously to a daughter of the ruling clan while she was performing a purification ritual in the Kamo River. The deity was initially enshrined at the top of Mount Ko, seen in the distance, but was transferred to this 7th-century building during the Heian period. 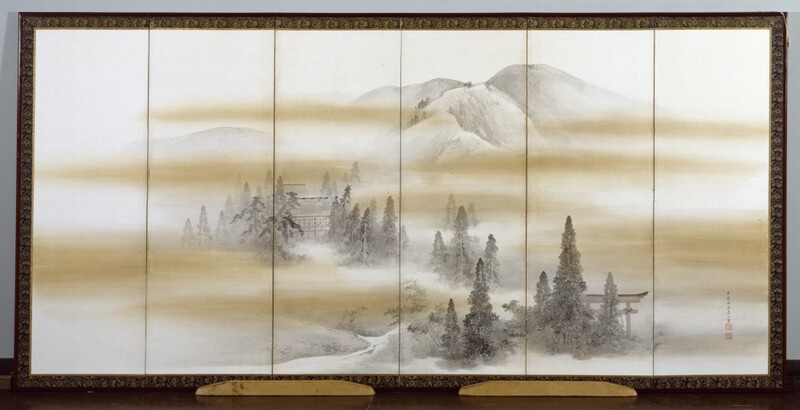 The mate to this screen, also in the Walters' collection (35.148), depicts the Byodo-in, a famous Buddhist temple in the nearby town of Uji. Thiis screen shows a Shinto shrine north of Kyoto and is a one of a pair with "Byodo-in Temple in Winter" (35.148). Working in the style of the 18th-century master Okyo, Mori Kansai wanted the two screens to contrast not only in terms of religion (Buddhist, Shinto), space (south, north), and season (winter, summer) but in the way they are painted--with a sharp contrast of light and dark in "Winter," a subtle gradation in "Summer." Provenance [Dealer] Osaka; Toyobi Far Eastern Art [Dr. Frederick Baekeland and Joan D. Baekeland], 1987-1988 [mode of acquisition unknown]; Walters Art Museum, 1989, by purchase.